DuckDuckGo achieved a new record in traffic by topping 1 billion searches in the month of January. The accomplishment by a rogue search engine that hangs its hat on user privacy is an understated feat in a space mainly dominated by a singular titan. DuckDuckGo leverages transparency by making all of its data and metrics available to the public. The public data posted in DuckDuckGo’s announcement shows an aggressive growth model that most any tech company would welcome. Moreover, being that DuckDuckGo competes with Google, the numbers might be more stunning than we think. And, well, they might be less stunning than others perceive them. Let’s break down what we should take away from DuckDuckGo’s data release and help ourselves understand what it could mean to the future of search. DuckDuckGo is a privacy browser. It allows users to search the internet without fear of intrusive data collection schemes. DuckDuckGo aims to take market share from major search engines, such as Google, which leverage user data as the foundation of their advertising funnels. DuckDuckGo’s slogan “The search engine that doesn’t track you.” plainly states its core mission. Next to the slogan sits a prominent call-to-action requesting that searchers “Help Spread DuckDuckGo!”. DuckDuckGo’s 1 billion monthly searches announcement makes one thing exceptionally clear: their search page call-to-action that requests people to encourage others to switch search engines is working. To date, private donations to DuckDuckGo sit at $1.3 million. The company, founded in 2008, now has 55 employees. Such numbers aren’t especially overwhelming in the world of big tech, but when we consider context, they become mind-numbingly spectacular. Additionally, DuckDuckGo displays Bing Ads network ads in its search results, as well as actively participating in Amazon Affiliates. Both alliances serve as revenue streams for the company. DuckDuckGo’s growth chart will impress even the most conservative of the privacy search engine’s critics. DuckDuckGo’s recent announcement focuses on data about January’s 1 billion searches, but January 2016 (think election, Cambridge analytics, etc.) serves as a pretty impressive starting point to what’s been a trendline heading to the moon. The 2016 presidential election made internet privacy a household issue. Today, we expect that all of our neighbors harbor some concern over the use of their private data. DuckDuckGo’s aggressive trendline confirms such public sentiment. The recent DuckDuckGo announcement may lend even more credence to the idea that people are uneasy with big tech’s data collection methods. Consider the timing of the company’s 1 billion monthly searches achievement. It follows narrowly behind their publishing a study accusing rival search giant Google of continuing to personalize search results for logged-out sessions. On October 10th, 2018, DuckDuckGo broke another record of its own: the search engine served over 30-million search requests on that single day. On October 10th, 2018, DuckDuckGo hit the 30-million daily search mark. For DuckDuckGo, the number broke a previous record. This event occurred shortly after the media exposed Google for a security breach the company failed to disclose. DuckDuckGo vs. Google: Is The Stage Set For A Showdown? You might be laughing right now. Google remains one of the most iconic and domineering technology companies in history. Google’s dominance is rarely the subject of debate by any tech pundit worth their weight in salt. But it is getting more and more difficult to ignore what’s happening over at DuckDuckGo headquarters. At what point does our disregard for any potential challenge to Google go from sound mind to cognitive dissonance? Most search experts would tell you that if a Google competitor exists, the distinction goes to Microsoft’s Bing. Bing, created in 2009, amasses around 12 billion monthly search requests, according to some stats. Other studies that measure search traffic show differing levels of Bing’s market penetration. It could be as low as 3%. It could be as high as 24%. Our view, based on our own client data, is that Bing’s share of the US search market is between these two numbers. This means Bing, whose ascent began only a year prior to DuckDuckGo’s, might be ten times the size of DuckDuckGo, depending on the source you trust most. Pinpointing the level of Google’s permeation is a quagmire too. They might be responsible for 63% of search market share. Or, according to a Statista mobile search graph, they might own the whole darn market. Analytics companies each use independent, unique methods when tracking search traffic. The confusion is worsened when we consider that Google likely doesn’t want to be seen as overly dominant; hence, wearing an antitrust target on their back. Likewise, Bing may be incentivized to appear larger in the search space; because, you know, those finicky shareholders. 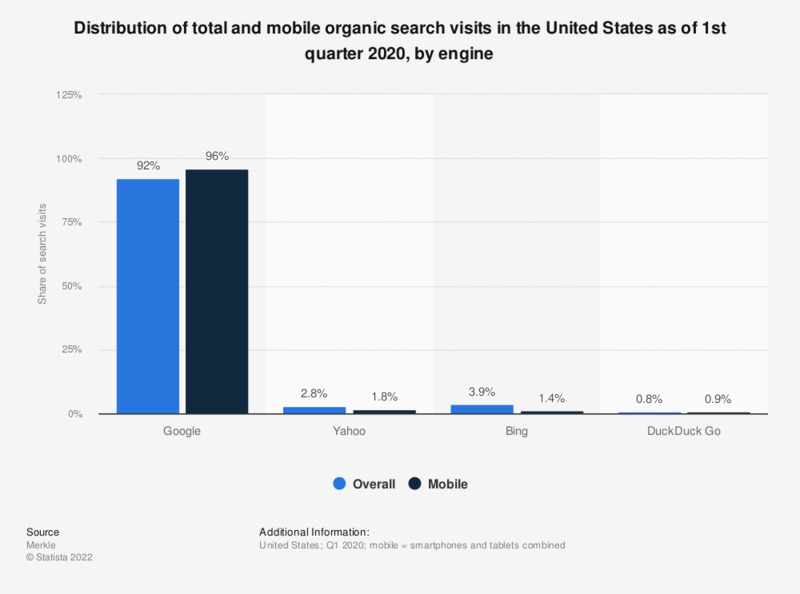 No matter which search analytics you use, Google dominates the space, and that’s all that matters. These search numbers cause rival search companies to feel overwhelmed and disconcerted. Google is a giant that isn’t going to be slain overnight, but some competitors are still willing to try. And they just might succeed if they chip away diligently and precisely over the long term. Bing competes with Google leveraging their Microsoft ownership, experience, and attentiveness to search quality factors. DuckDuckGo competes with Google on privacy issues. DuckDuckGo’s playing field might be more conducive to search engine market penetration goals for a niche audience. DuckDuckGo thrives on media discord and outrage that centers around privacy issues. And media conglomerates aren’t likely to lift their collective feet from the privacy outrage pedals soon. As shown above, DuckDuckGo cashes in each time a significant privacy breach is revealed by the media. Last month, the company proved that it could be a useful provider of the information — and that’s a huge deal. If the DuckDuckGo marketing strategy transitions from opportunist to opportunity-creator, Google executives can hardly afford to continue to ignore DuckDuckGo. DuckDuckGo now sits at the helm as a privacy advocate and watchdog. The second part might complicate Google’s existence in the space. DuckDuckGo’s momentum is now impossible to ignore. With trendlines pointing towards the moon and a marketing strategy that yields results, it is evident that the privacy search engine is going to siphon at least some of Google’s market share. In a few years, could DuckDuckGo become the second-largest search platform in the world? These are questions that we now must seriously ask ourselves. Are we honestly considering discussing DuckDuckGo and SEO in the same conversation? DuckDuckGo’s momentum swing does not mean that every site on the web should be tackling some new SEO development. But it isn’t a bad idea to understand a few essentials, either. The quiet, and now not so quiet, rise of DuckDuckGo means more sites are beginning to take notice and examine whether they can get in on the ground floor of a new search prospect. The foundation of the Google algorithm is RankBrain, an artificial intelligence deep dive that serves to extract user search intent. It’s advanced and robust and, well, impressive as heck. DuckDuckGo’s search algorithm uses what’s known as the DuckDuckBot. DuckDuckBot pulls results from Yahoo!, Yandex, Bing, and several hundred other sources. As an obvious starting point, one could logically surmise that Bing-optimized sites perform well in DuckDuckGo. As mentioned above, DuckDuckGo earns revenue by displaying Bing ads, so it would stand to reason that the two might be cozy on the SEO side of things. Just like Google, DuckDuckGo attempts to resolve search issues at the SERP level. Need to change your car battery but have no time for clicking on a search results link? That was precise, convenient, and familiar. DuckDuckGo’s privacy-focused experience means that it doesn’t tally a searcher’s location, nor other vital facts that might influence a result. That said, it does utilize IP address locations, which can help make the results of a location-based search more relevant. This might mean a return to using location+search request- style optimization. In other words, if you are a bakery in the Denver suburb of Cherry Creek, you might deploy “Cherry Creek, Colorado” in your meta-description. DuckDuckGo recommends that websites looking to increase search rankings in DuckDuckGo’s platform acquire “links from high-quality sites.” The search engine gives Wikipedia as an example of a high-quality site. DuckDuckGo should be considered a viable participant in the search space, but there is yet arise a compelling reason to optimize your website for it. If you employ search engine best practices, you are probably already set up for DuckDuckGo SEO success. Plus, if you purchase ads through the Bing Ads network, you are probably getting DuckDuckGo exposure already.